I am a professional artist whose work focuses on contemporary abstract encaustic painting. 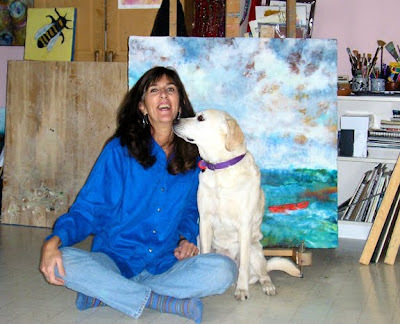 I share my studio with one or both of my retrievers from Canine Companions for Independence. My artwork over the past twelve years has consisted of, for the most part, encaustic painting. With the encaustic technique, I am able to pull together years of experience with ceramics, sculpture, textiles, drawing and painting into one medium. This process lends itself to revealing a history, the creation of the work itself, by building up, then scraping back into the layers. Vibrant colors, luminosity and surface quality are merely a few of the appealing characteristics of encaustics. Much of my work is inspired by nature and the places I’ve lived, from the Palos Verdes Peninsula to Santa Barbara and finally, Sonoma County. A lifetime love of the ocean inspires my palette along with themes in my paintings. Working with beeswax enables me to build, excavate, scribble, tear down and rebuild until the work’s final destination reveals itself. Accidents can happen which, most of the time, work out well. Encaustic is a wonderful process, a challenge I continue to welcome. My encaustics have been published in The American Art Collector, an annual juried collection of national artists. I have been teaching encaustic painting classes both privately and through Riley Street Art Supplies in Sonoma County since 2002.